The event is this coming Saturday, October 5, 2013, from 10-6. This festival was voted “Best Art Event in Northern Virginia” by readers of Virginia Living Magazine. More than 300 artisans will be exhibiting and selling their creations and there is music and food as well. I’ve been to two of these events and the weather was nice both years—a great time to be outdoors (and supporting the arts!). Visit www.artontheavenue.org for more information as well as a list of vendors. I will be selling gallery wrap photo canvases (variety of sizes), matted and framed photographs, matted photographs, lots of different greeting cards and colorful photo necklaces. Directions by Metro: Your best bet to the festival—Braddock Road is the Metro stop nearest Art on the Avenue. Each half hour, starting at 10:00 am until 6:00 pm, there will be a FREE DASH bus going to and from the corner of Bellefonte/Mt. Vernon Avenue and the Braddock Road Metro Station. Look for the sign that says “Ride Me to Art on the Avenue.” Or you can walk — it is a 15 minute walk to the Festival from the Metro stop. Simply exit the station and turn right to Braddock Road. Follow Braddock Road under the underpass to the next light and turn right onto Mt. Vernon Avenue. If you’re in the area and can make it, stop by to say howdy or if we’ve never met in person, introduce yourself! Pick up a free bookmark and register to win a FREE 20×30 gallery wrap canvas (your choice) from my existing inventory! Below are just some of the images I have available in 5.5 x 8.5 greeting cards. Thanks to my friend and fellow photographer/blogger, Scott Thomas, for inviting me to guest post on his blog. He did a great job laying out all the components for the feature, which was first published in the Summer 2013 issue of Celebrate Home Magazine. You can download all four issues of the magazine FREE on our website at http://www.celebratehomemagazine.com. Print copies (at cost + shipping) are also available and our site will link you to magcloud.com to purchase. Head on over to Scott’s blog, Views Infinitum, to see the post! 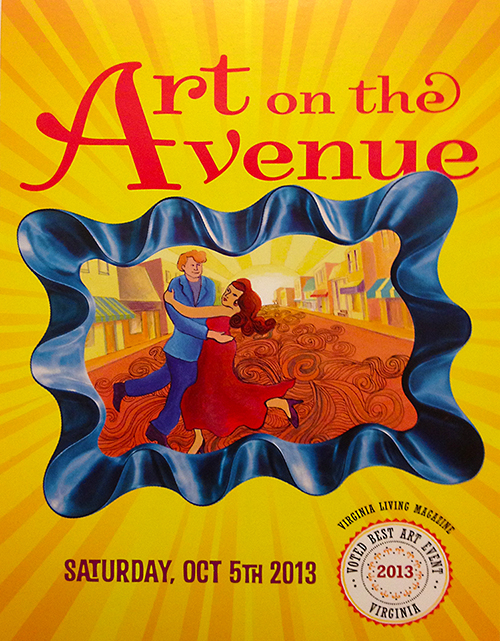 Come join me at “Art on the Avenue” on October 5! The event is Saturday, October 5, 2013, from 10-6. This festival was voted “Best Art Event in Northern Virginia” by readers of Virginia Living Magazine. More than 300 artisans will be exhibiting and selling their creations and there is music and food as well. I’ve been to two of these events and the weather was nice both years—a great time to be outdoors (and supporting the arts!). Visit www.artontheavenue.org for more information as well as a list of vendors. Directions by Metro: Your best bet to the festival! Braddock Road is the Metro stop nearest Art on the Avenue. Each half hour, starting at 10:00 am until 6:00 pm, there will be a FREE DASH bus going to and from the corner of Bellefonte/Mt. Vernon Avenue and the Braddock Road Metro Station. Look for the sign that says “Ride Me to Art on the Avenue.” Or you can walk — it is a 15 minute walk to the Festival from the Metro stop. Simply exit the station and turn right to Braddock Road. Follow Braddock Road under the underpass to the next light and turn right onto Mt. Vernon Avenue. If you’re in the area and can make it, stop by to say howdy or introduce yourself (and pick up a free bookmark, too)! While you’re there, register to win a free 20×30 gallery wrap canvas (your choice) from my existing inventory!